Although distributed generation continues to chart a sustainable path to produce clean energy, many poorly-sited renewable energy projects threaten to continue the fragmentation and industrialization of our southwestern deserts. If all of the projects are built, they would rival the destructive impacts of climate change and urban sprawl on desert species. As long-time readers of this blog know, there have been plenty of bad projects approved on public lands in the desert, with some good news sprinkled here and there. The list below - not at all comprehensive - provides an update on the status of some of the most significant projects. 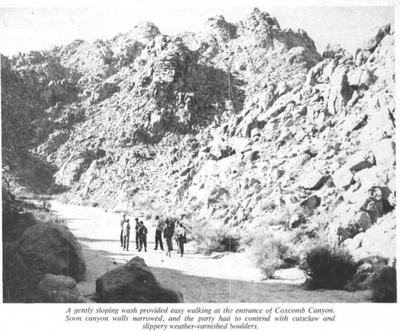 In late 1952, Sierra Club member Bill Henderson roused excitement during a New Year's party for the Club's Desert Peaks section for an adventurous hike into the Coxcomb Mountains in present-day Joshua Tree National Park. Written up in the Sierra Club Bulletin and Desert Magazine, the desert explorers reached the roughly 4400 foot high summit without trails. As Louise Werner wrote in the May 1953 issue of Desert Magazine, "[t]he view to the southeast encouraged speculation and planning for future climbs. Range after range of desert mountains stretched as far as we could see: the Palens, the Granites, the Little Marias, the Big Marias. Like an undulating carpet of chocolate-brown velvet, they stretched to the vanishing point." 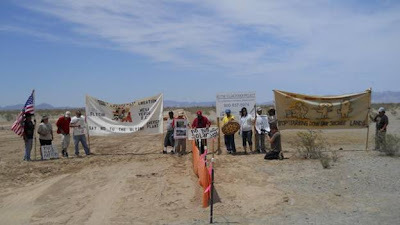 Film maker Robert Lundahl captures Native American concerns regarding the destruction of sacred sites during the initial construction of Solar Millennium's Blythe solar power project. Ironically, the bulldozers already cleared an ancient geoglyph known as "the sun." The solar project is being delayed since Solar Millennium's switch to photovoltaic panels will require approval, and the company is also attempting to secure financing. If the company clears these hurdles, construction could resume next year and destroy up to 11 square-miles of historical sites and desert habitat. Indigenous America Asks Questions About U.S. "Green" Policies from Robert Lundahl on Vimeo. According to Forbes, German firm Solar Millennium and its American front company - Solar Trust of America - have announced that they will not accept the 2.1 billion dollar Federal loan guarantee for the Blythe solar power project, and they are now going to use photovoltaic technology (the same panels used on rooftops!). The company switched to photovoltaic (PV) technology from the antiquated solar trough design because PV is much more cost efficient. However, the company's change in technology represents a significant departure from its original project application and may require additional environmental review. The abrupt change in plans may have been the reason the company abandoned the Federal loan, which was granted based on its original solar trough plans. The company will have to compete for private investments as the markets are taking an ugly turn. Big Solar and Wind companies still pretend they can do no harm to the environment, projecting a misleading image that glosses over the damage their projects cause. We have to face the facts if we're going to chose the right renewable energy path--which is distributed generation (such as rooftop solar), or projects on already disturbed land (such as those identified by the EPA's RE-Powering America's Land program). Before I break into the list, I will say that coal and oil companies are also guilty of misinformation, and there is no doubt that their products damage the environment and our health. But if we are going to prevent renewable energy from taking a path that also destroys our open spaces and wildlands, we need to distinguish between fact and fiction. In a blog post titled "Every Rooftop Matters," Sierra Club Executive Director Michael Brune explains the important role rooftop solar will play in cutting down harmful greenhouse gas emissions. The Club's efforts to promote distributed generation are a welcome development given the troubling plans by some energy companies to bulldoze hundreds of square miles of pristine desert for remote projects. Two of the massive projects have already begun construction, displacing hundreds of threatened desert tortoises and destroying Native American sacred sites. In separate news, Google announced its investment of 280 million dollars in SolarCity, a rooftop solar business. The investment could create 7,000-9,000 solar roofs. The announcement comes on the heels of Google's less appealing investments in the destructive Ivanpah Solar energy project (pictured below) and the Alta Wind Energy Center, a wind project that could result in at least 3,000 bird collisions each year. Secretary of Interior Kenneth Salazar and California Governor Jerry Brown stand with executives from German firm Solar Millennium during the groundbreaking ceremony for the Blythe Solar power project. Even though Solar Millennium's board is under investigation for misappropriation of funds and embezzlement, Mr. Salazar ok'd the project and over 2.1 billion dollars in taxpayer-backed loans and grants for the company. Initial stages of construction have also destroyed part of a Native American sacred site. According to the Department of Interior, these massive solar power projects on public land are called the "New Energy Frontier" --seems like just another version of corporate greed, scandal and disrespect for the public's land and money. Perhaps they are ignoring the real energy frontier-- the untapped potential of rooftop solar, which energy experts assess can meet much of our energy demand in the southwest without sacrificing public land. 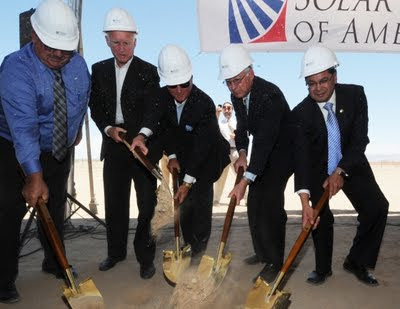 German company Solar Millennium LLC and its American front "Solar Trust of America" are holding a groundbreaking ceremony for the Blythe Solar power project tomorrow, which California Governor Jerry Brown and Secretary of Interior Kenneth Salazar plan to attend. Their attendance is surprising since the 11 square mile project is under scrutiny for financial misconduct and destruction of sacred Native American sites. Germany began investigating Solar Millennium after uncovering reports that an executive was paid 9 million Euros (about 12.5 million dollars) after working only 74 days at the company, and other board members are under investigation for embezzlement. Despite the scandal, Solar Millennium's project is still on track to receive over 2.1 billion dollars in loans and an 18 million dollar grant from the Federal government (courtesy of the taxpayer). As I wrote about yesterday, the White House announced its Campaign to Cut Waste and highlighted the DesertTortoise.gov website as a prime example of the sort of "waste" the government hopes to eliminate. Chris Clarke over at Coyote Crossing learned from someone familiar with the website that it costs approximately 125 dollars, and a few hours of labor to upload new information each year. The site received 49,000 visitors from January through April this year. That's less than a penny per visitor, and we can expect tens of thousands of more visitors by the end of the year. Also, the White House apparently did not bother giving the wildlife officials that maintain the website (as one of their many tasks) any advance notice that they would target the effort as an example of "waste." 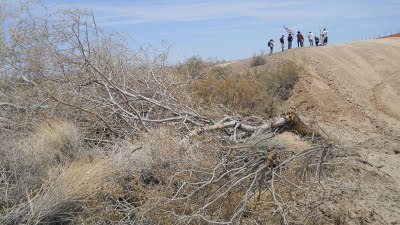 Chevron and Solar Millennium LLC have begun bulldozing what will ultimately be an 11 square-mile field of mirrors and steel, replacing old growth desert and ironwood washes in the Sonoran desert. The construction is also cutting into an area considered sacred by Native Americans, with giant geoglyphs depicting deities carved into desert gravel. The largest geoglyph near the project is of the god Kokopelli, which plays a central role in some Native American tribes' cosmological view. A coalition of Native American and civic groups filed a legal challenge against the Department of the Interior for approving six massive solar power projects in California's desert, alleging that the Department did not conduct adequate environmental reviews and did not properly consult with Native American tribes. The legal challenge points to several Federal statutes that the Department of the Interior ignored in its "fast track" approval of the solar projects. The collective intent of the statutes is to ensure that the Federal government fully considers the consequences of its proposed actions -- in this case, providing public land and taxpayer-backed financing to several energy companies so they can build on over 40 square miles of mostly pristine desert habitat and cultural landmarks. The Chuckwalla Valley in California's Colorado Desert is currently being considered for multiple solar energy projects, and has also been targeted for development in the Federal government's solar energy study zones. The largest solar power project in California, the Blythe Solar power project proposed by Solar Millennium LLC, already received approval from the California Energy Commission (CEC), and NextEra's Genesis Solar power project received preliminary approval. Both of these projects are proposed for public lands. 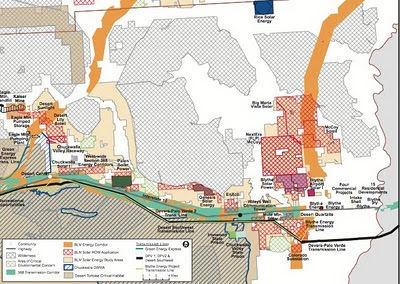 These two projects alone would fence off and bulldoze over 10,000 acres, and as you can see in the graphic below, the desert valley that currently is home to desert tortoise, Mojave fringe-toed lizard, bighorn sheep, lynx, burrowing owls, and kit fox will be transformed into an industrial zone if all of the remaining projects are approved. Kevin Emmerich of Basin and Range Watch commented on my previous post on the Blythe Solar power project that, in addition to the environmental damage Solar Millennium will do with its Blythe project, the company will also bulldoze over a thousand important Native American points of significance on the site. So it is even more unfortunate that the California Energy Commission (CEC) approved the site. You can read a continuation of this discussion on Chris' Coyote Crossing blog and the Basin and Range Watch site. One of the largest solar sites currently under review by the California Energy Commission (CEC)--the Blythe Solar power project--received final approval today. The site will disturb at least 7000 acres of habitat in the Colorado desert in Southern California, making it the largest site to be approved this year. 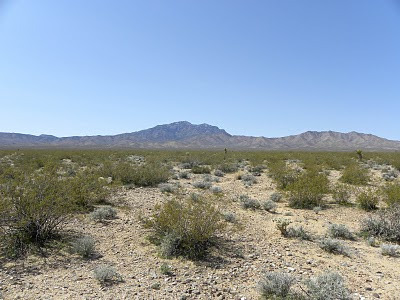 The project will destroy sand dune habitat for the threatened Mojave fringe-toed lizard (at least 57 were spotted on the site), bighorn sheep foraging grounds, and nesting areas for the burrowing owl. Here is a brief overview of the industrial transformation proposed for the Mojave and Colorado Deserts in Southern California. A couple of the projects will only have a minimal impact on the desert ecosystem because they are sited on former agricultural land (Beacon and Abengoa Solar). The rest will contribute to the fragmentation and deterioration of desert ecosystems. The Blythe Solar Power project proposed by Solar Millennium was approved by the California Energy Commission (CEC), according to the Presiding Member's Proposed Decision. The release of the Proposed Decision starts a 30-day comment period, but the decision is likely final. The Blythe Solar power project is located in the Colorado Desert near the California town of Blythe, and is slated to provide 1,000MW of energy. It will also involve paving 6,958 acres of desert habitat on public land. Solar Millennium will be required to mitigate for the damage to desert tortoise habitat and preserve 6,958 of tortoise habitat elsewhere in the Colorado Desert, which could cost nearly $14,000,000. That will be in addition to other mitigation costs for impacts on State waters, bighorn sheep, and threatened Mojave Fringe-toed lizard. The California Energy Commission (CEC) recently released it's draft Staff Assessment and Environmental Impact Statement for the Blythe Solar project, an industrial-scale site that would disturb approximately 7,030 acres of Colorado Desert. The site is just west of Blythe and would sit in the middle of the Palo Verde Mesa next to the McCoy Mountains. In summary, the environmental impact statement points out that the most significant impacts of the site would be the loss of desert washes--which are important to the maintenance and sustainability of desert aquifers--and the loss of desert tortoise and Mojave Desert fringe-toed lizard habitat. It appears that Palen and Blythe will be the largest plants in terms of energy output (which usually equates to larger footprint in the desert, as well), and all three projects would utilize dry-cooling technology, reducing the amount of water taken from local aquifers.